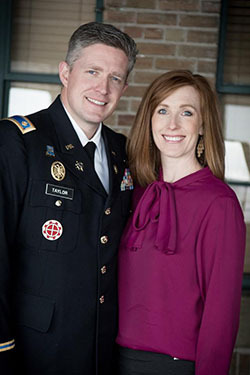 OGDEN, Utah –The wife of former North Ogden Mayor Maj. Brent Taylor will accept the Freedom Through Rhetoric Award on his behalf at Weber State University’s Spring 2019 Speech Showcase, April 18 at 7 p.m. in the George S. Eccles Lecture Hall (Elizabeth Hall Room 229). Jennie Taylor will accept the award for her husband, who died while deployed in Afghanistan in November 2018. The award is presented to one individual each semester, who has made a significant difference in the community through use of rhetoric, the art of effective or persuasive speaking or writing. Weber State President Brad Mortensen and Department of Communication Chair Sheree Josephson will present the award to Taylor. Brent Taylor was helping train Afghan forces when he was killed in an apparent insider attack. He had been a part of the Utah National Guard for 12 years and was serving a second term as mayor for North Ogden City at the time of his deployment. The communication department in Weber State University’s Telitha E. Lindquist College of Arts & Humanities hosts Speech Showcase every fall and spring semester. The best speaker from each of the 26 sections of Principles of Public Speaking is selected to compete to become a finalist in the showcase. The top five finalists will speak in front of an audience and judges for a small cash prize.